Calendars is core application on iPhone or iPad which keeps track of what you're doing and when. That may explain why calendar came stock with iOS when it is firstly published in 2007. We use calendar to remind us of important events as well as arrange our daily life and work. Therefore, Calendar is an indispensable app on iPhone and it is necessary to safeguard your calendar data. Usually, we would like to sync our iPhone or iPad to iTunes and iCloud for backup in case the calendar is lost. When you find your calendar is lost, you need to restore your iPhone or iPad with the entire backup file including everything you have backed up to iTunes, which costs too much. With iFonebox, you can make it easier. As iFonebox is specialized iOS data recovery software, it can extract various iPhone/iPad data including Contacts, Notes, Calendar, Reminders, Voice Memos, and Photos etc from iPhone and iPad as well as from iTunes/iCloud backup file. 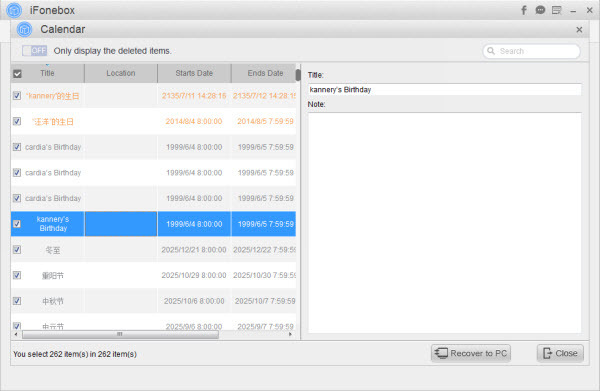 Besides, iFonebox makes it possible to selectively recover and export certain data to computer. You can download a free trial version to have a try and you need to pay for the registered version if you want to successfully transfer the calendar to pc for backup. Note: iFonebox is available for both Windows and Mac OS, and this guide is going to take the Windows version for example. Install and run the full version of iFonebox, and then hook your iPhone/iPad to your PC. Click “Start” to start off. By doing so, you have chosen “Recover from iOS Devices”. Click on the icon of Calendar to start exporting the calendar from your iPhone or iPad. After exporting the calendar with iFonebox, you can transfer it to your computer. In addition, you can do some editing about the Calendar before transferring to your Windows PC.